With the New York Yankees floundering at 25-31, 11.5 games out of the division and 8 games out of the wild card, things are looking desperate. Luckily, the Yankees will look upon one man, a master of the hill, an ace upon aces, to right the ship and bring the Bombers a twelfth straight division title. What? Roger who? That man, the savior is.... Runelvys Hernandez. Yes, after signing him to a minor league contract, the Yankees will surely break out of their season-long pitching slump. This article goes as far as describing "Elvis" as "former Kansas City Royals ace." Now, skeptics might wonder which of his four seasons, none of which featured more than eight wins or an ERA below 4.30, would give Hernandez ace properties. But those skeptics would be wrong. Hernandez, he of a lifetime 4.77 K/9IP, is a force to be reckoned with. After all, Baseball-Reference.com has Hernandez's most similar player as: Tim Redding. And Yankees fans all know how devastating Tim Redding was in 2005. So look not, Yankees fans, towards the overweight beacon of evil that is Roger Clemens. 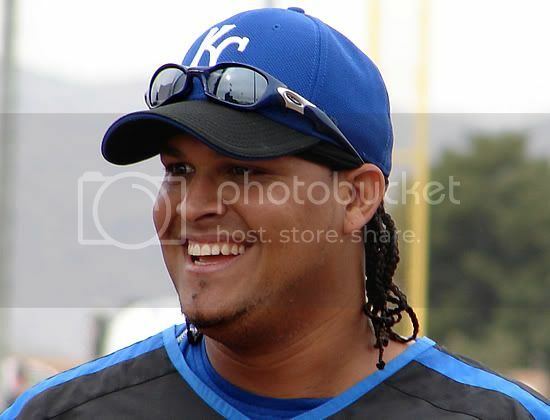 Look instead upon the face of your savior, the one and only Runelvys Hernandez.